I read It about 20 years ago, but I had never gotten around to seeing the original filmed version in its entirety. Therefore, I came to this movie with only a few recollections of events in the story. Overall, it was a decent movie, and it made me jump several times. However, I felt that the pacing could have been a little tighter, and I was surprised it was all on the kids, as I seemed to remember them coming back as adults in the book. But perhaps that's just my faulty memory at play. 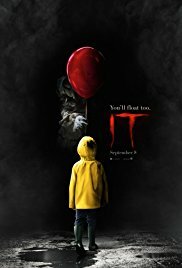 Bill Skarsgard did an excellent job and was very creepy as Pennywise, and the kids all handle themselves well in their roles. I'm not a big horror fan these days, but if you are, you'll doubtless find something to like in this movie. For me, it was a 3-star watch. I'm glad I saw it, but I wouldn't rush to watch it again.